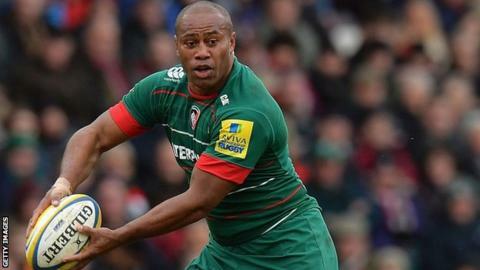 Five British-based players have been named in Fiji's 31-man Rugby World Cup squad but Leicester Tigers centre Seremaia Bai has not been included. However Bai, 36, who has played in 49 Tests, has been named as a non-travelling reserve. Tigers team-mate, wing Vereniki Goneva, is included, as is Ospreys centre Josh Matavesi, who has also played at fly-half for his country. Fiji are in Pool A along with hosts England, Wales, Australia and Uruguay. Montpellier flanker Akapusi Qera captains a squad which includes two Fijian-based amateurs, props Lee Roy Atalifo and Peni Ravai. Coach John McKee said he had picked a squad which he was confident "will rise to the challenge". "With this talented group of rugby players, fiercely proud of representing their country, I believe we have a team of players who will bring their best game to the biggest contest in international rugby," McKee said. "After the successful Pacific Nations Cup campaign and current training camp here in Fiji the squad is working well towards the challenges ahead." Fiji are ninth in the world rankings after they beat Samoa in the recent Pacific Nations Cup final. Forwards: Sunia Koto (Narbonne), Tuapati Talemaitoga (Pays D'Aix), Viliame Veikoso (Doncaster); Lee Roy Atalifo (Suva), Isei Colati (Nevers), Campese Ma'afu (Pays D'Aix), Peni Ravai (Nadroga), Manasa Saulo (Timisoara); Tevita Cavubati (Ospreys), Leone Nakarawa (Glasgow Warriors), Api Ratuniyarawa (Agen), Nemia Soqeta (Biarritz); Sakiusa Masi Matadigo (Lyon), Akapusi Qera (captain, Montpellier), Malakai Ravulo (Farul Constanta), Netani Talei (Harlequins), Dom Waqaniburotu (Brive), Peceli Yato (Clermont). Backs: Nemia Kenatale (Farul Constanta), Nikola Matawalu (Bath), Henry Seniloli (Treviso); Joshua Matavesi (Ospreys), Ben Volavola (Waratahs); Levani Botia (La Rochelle), Vereniki Goneva (vice-captain, Leicester), Gabiriele Lovobalavu (Bayonne); Nemani Nadolo (Crusaders), Waisea Nayacalevu (Stade Francais), Asaeli Tikoirotuma (London Irish); Kini Murimurivalu (La Rochelle), Metuisela Talebula (Bordeaux).